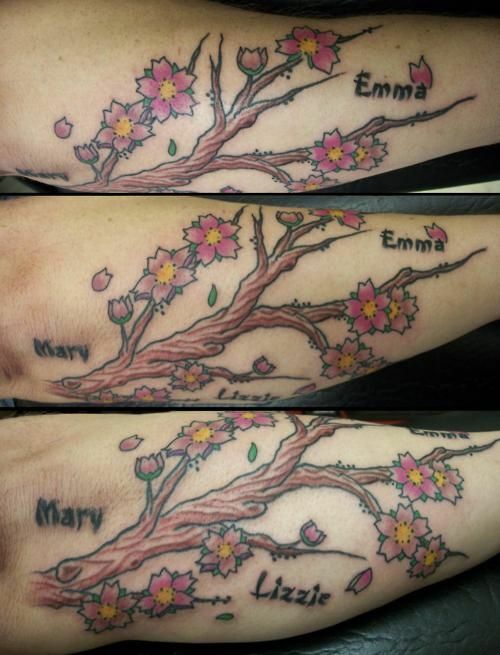 Nice tribute tattoo with three names placed in and around the branches and flowers of a cherry blossom tree. Cherry blossom designs look great on both men and women. This guy inked a big branch on his outer forearm with small pink and yellow cherry blossom flowers and buds. The flowers are accented with little bright green leaves with a few falling off. The branches have simple brown lines that partially fill them in and the entire image is outlined in black. Inking names of children and other relatives on the body is common in Hawaiian culture. The girl’s names go nicely with the cherry blossoms because these flowers represent beauty. Another idea would be to write the letters with petal shapes.